Bord na nÓg – Calling on all residents of Drumsna, Annaduff and Dromod. Our Underage boys’ registration for U17s down to nursery is due to take place next Saturday the 2nd of February and Sunday the 3rd from 12 mid-day to 1:30pm both days. All new/old members living in our parish are very welcome to come along meet some of our coaches have a chat about the plans for the coming season of football. Our U17s and U13s are back training in preparation of the up-coming leagues best of luck to the management and players for the year ahead. Leitrim Supporters Club – The annual Leitrim supporters tickets will be coming available over the next few days. Please note Annaduff GAA gets a quota that we must sell, so please only buy them off any member of our club executive. New Baby – Congratulations to Noel & Tracy Ward, Dromod on the birth of their first child a Son named Dean born on the 21st January. A new grandson for John & Maura and I am sure his neighbour and cousin Oran will have a pair of football boots so we can get him togged out in Maroon & Gold before too long!!. Annaduff Health & Wellbeing – Our new health and well-being officer Lisa Duignan has set up a new page on facebook please like and share as it will have all up-coming healthy eating and exercise/walking events over the year. Lotto – The Annaduff Parish & GAA lotto draw took place in the Brandywell, Dromod on Sunday the 27th of January. Numbers 4,7,14,16 there was no winner. Bord na nÓg – Calling on all residents of Drumsna, Annaduff and Dromod. Our Underage registration for U17s down to nursery is due to take place on Saturday the 2nd of February and Sunday the 3rd from 12 mid-day to 1:30pm both days. All new/old members living in our parish are very welcome to come along meet some of our coaches have a chat about the plans for the coming season of football. Our U17 started back training last week and U13s due to start this week in preparation of the up-coming leagues best of luck to the management and players for the year ahead. Adult teams – Our Senior and Junior teams started their training on Saturday last best of luck to Karl Foley and his selectors along with all the lads, we wish them every success for 2019. Sports Capital Funding – The Club is delighted with the announcement of grant aid of €40,000 towards ongoing developments at our Club grounds. Big thank you to our hard-working committee. Lotto – The Annaduff Parish & GAA lotto Next draw takes place in the Brandywell Dromod on Sunday the 27th of January. Jackpot now stands at €1900. So as always please get your tickets in and Thank you for your continued support !!! Carrick Hurling – Hard luck to the management and players of the Carrick Hurling team who lost out to Castleblaney Faughs on Sunday last by a single point. It’s Castleblaney who advance to the All-Ireland final. Sympathy – Annaduff GAA wishes to pass on our sympathy to the Guckian family Derrywillow following the sudden death Padraig Guckian on January 16th 2019 at U.C.H.G. to his wife Imelda and sons Frank, John, daughters Marie Clarke and Annette Cosgrave and extended family. Ar dheis Dé go raibh a hanam. Lotto – The Annaduff Parish & GAA lotto draw took take place in Duignans, Drumsna on Sunday last 13th of January. Numbers 5,7,13,16. No winner. Annaduff Ladies – Annaduff Ladies will be having their Dinner Dance and presentation of their Junior medals on the 1st February in Cox’s Steak House, Dromod. Tickets just €30 and include a 3 course meal followed by music by Featherhead. Tickets can be ordered through their Facebook Page or are available from any of the Players. Connacht Scór Na nÓg Finals – Hard luck to our Set dancers – Anna Crossley, Caoimhe Mooney, Aobhlinn Maxwell, Ailíse Maxwell, Katie Faughnan, Eimear Healy, Claire and Laura Flannagan in the Connacht finals on Sunday last in Claremorris. Disappointing to come away with no medals but they danced very well and were delighted with their performance. AGM – The second part of our Club AGM to fill the vital rolls took place on Sunday last. With a better turnout all the positions were filled. Chairman: Gerry Newton, Development Officer: Donal Fox, Assistance Treasure: David Duignan, The club Children’s officer: Maura Sharkey and Health and well-being officer: Lisa Duignan. Thanks to all who turned out. It is hoped following on from the meeting that more people will get involved from our Parish/ Community with the Parish lotto among other jobs. If you can help out in any little way it would be appreciated its very satisfying for yourself as well as been able to help the young people in our community. The BT Young Scientist Awards – Massive congratulation’s to Erica Ridge, Hugh and Darragh Boyce transition year students in Mohill Community College who scooped 1st place in their category of behavioural science in the RDS last week on their project of decreasing childhood obesity. Erica when not in school works in the family restaurant, Coxs Steakhouse, Dromod and Hugh and Darragh work in their family restaurant, The Brandywell Restaurant also in Dromod. A big problem for our young people today more than ever. Well done and congratulations on your award!! Lotto – The Annaduff Parish & GAA lotto Jackpot now stands at €1800. Next draw will take place in Duignan’ss Drumsna on the 13th of January. So as always please get your tickets in and Thank you for your continued support !!! Connacht Scór Na nÓg finals – Best wishes to Fionnuala Maxwell and her Set dancers – Anna Crossley, Caoimhe Mooney, Aobhlinn Maxwell, Ailíse Maxwell, Katie Faughnan, Eimear Healy, Claire and Laura Flannagan in the Connacht finals on Sunday next the 13th in… Claremorris. Also a special mention to Anna Crossley for training the girls and Eithne Fox for her assistance. They have done brilliant to date and we wish them every success. AGM – The AGM to fill the vital roles of Chairman, Children’s officer and Development officer among others will reconvene on Sunday next the 13th at 3pm in the dressing rooms. It is vital that there is a good turnout for this meeting. All Players/members need to attend also any new people from our Parish from Dromod to Drumsna and all in between we would be delighted to see you. Smith Monumentals IFC – The excitement is building around the Parish as Karl Foleys men get ready to take on Fenagh in the Intermediate Championship final on Sunday next the 14th October at 1pm in Pairc Sean McDiarmuid Carrick on Shannon. We want to see all the flags up and lots of support in Carrick. To get the weekend off to a sporty start Annaduff GAA proudly presents “Up for the Match” Join us for a night of music, fun and interviews with past players and special guests. Kick off is at 9.30pm in The Brandywell, Dromod on Saturday 13th of October. MC on the night will be Mr Donal Fox. Everyone welcome. Westlink Coaches U15s Championship – Hard luck to our U15s who were defeated by St Josephs in Carrigallen on Friday evening last. The Annaduff lads had a very good first half but a couple of early goals in the second half for St Josephs seen them finish strong. on Saturday last where they played Naomh Eoin ( Antrim), Tuam Cortoon ( Galway), Moylagh ( Meath) and Mullinalaghta (Longford) they won four out of five games. The talent in Annaduff just keeps giving !!! Well done Ladies. Club Shop: The Annaduff GAA shop is online with a wide range of O”Neills gear to Purchase. The shop can be accessed via the AnnaduffGAA.ie menu or directly on https://www.oneills.com › AnnaduffGAA › GAA Club › Ireland. Fixtures: U15s round 7 Championship away to Kiltubrid on Saturday 13th at 12 noon. Smith Monumentals IFC – All roads lead to Pairc Sean Carrick on Shannon on Sunday next (30th) at 2:30pm where Karl Foley’s men will face Eslin in the semi final. Massive effort been made by the management and players so let’s get behind the Annaduff lads and pop into Carrick on Sunday to support. Westlink Coaches U15s Championship – Hard luck to our U15 boys who were defeated by Ballinamore on Friday last. The lads had a great first half but Ballinamore got a couple of goals early in the second half which changed the game. Full-time score Annaduff 1-09 Ballinamore 4-16. Future Stars – The Annaduff future stars travelled to Mohill on Saturday last to participate in a mini blitz with boys from U9s, U7s and nursery, pictures on our face book page AnnaduffGFC. Big thanks to the Parents and Coaches. Club Shop – The Annaduff GAA shop is online with a wide range of O”Neills gear to Purchase. The shop can be accessed via the AnnaduffGAA.ie menu or directly on https://www.oneills.com › AnnaduffGAA › GAA Club › Ireland. Lotto – The Annaduff Parish & GAA lotto draw took place in McLoughlins, Drumsna on Sunday the 23rd of September. Numbers 9, 10, 15, 18. No winner next draw takes place in the Brandywell Dromod the 7th October. Fixtures – U15s round 5 Championship home to Fenagh on Saturday 29th at 12 noon. Smith Monumentals IFC – The Annaduff lads faced Ballinaglera in the Q/final on Saturday last in Ballinamore. The pressure was on for our lads to get a good start, to which the lads did deliver. With our side getting 1:04 inside the first 7 min with points from Kenny Cox and Sean Mc Nabola and a goal from Sean Duignan after a well-worked move up the field and a super pass from Kenny. But as always Ballinaglera were always going to come strong and they did shoot some lovely points in the first half to bring the sides level by the 23rd min at 1:6 to 0:9 Ballinaglera. Ronan McCormack getting the last score of the half to leave the Annaduff men 1 up at the break. The second half started with 2 converted frees from Sean McNabola and Sean Duignan followed up by another super worked goal finished by Alan Glancy palming it into the Ballinaglera net. In the 48min Annaduff were reduced to 14 men following a straight red for Keith. But Ballinaglera failed to make any impact with the extra man. Themselves reduced to 14 men in the 56min but by then the game was as good as put to bed. Full-time score Annaduff 2:15 Ballinaglera 0:14. now we march onto the Semi-Finals where we face Eslin. Team: Darragh Burke, Chris Farrell, Hugh Moylan (0-1), Dean Gill, Mattie Cox, Dillon Keane, Jimmy Cox, David Duignan (0-1), Ronan McCormack (0-1), Eoin Gill, Sean McNabola (0-5)(3f), Conor Reynolds, Sean Duignan (1-3)(1f), Kenny Cox (0-4), Alan Glancy (1-0). Gavin O Brien for Sean Mc (60min) and Donal McNabola for Kenny (62min). Westlink Coaches U15s Championship – Our U15 boys were home to Melvin Gaels on Friday (14th). With a couple of lads missing from injuries, our lads did struggle but none the less kept trying to leave a Full-time score Annaduff 4-03 Melvin Gaels 5-11. We wish Tommie Taylor a speedy recovery following an injury at training earlier in the week. Pieta House Presentation – Annaduff GAA presented a cheque for €6,260 to Pieta House on Thursday evening last. This money was raised in the parish through the Annaduff Family Fun Day. In the past five years, the club has raised over €35,000 for worthy charities. Well done to everyone who has supported and contributed. U13s on tour – Our U13s team headed to Drumshanbo on Saturday last to the Blueway Waterpark. A great day was had by all, thanks to our Coaching officer Ronan Mooney for organising the trip. Sympathy: Annaduff Gaa wish to pass on our sympathy’s to the Gill family, Headford, Drumsna on the recent death of Catherine`s sister Mary O Keeffe, Knocknadiha, Tournfulla, Co Limerick. May her gentle soul rest in peace. Lotto: With the Jackpot won in the last draw. Next draw will be in McLoughlins, Drumsna on next Sunday the 23rd of September where the jackpot will be €1000. U15s round 2 Championship away to Gortletteragh on Monday (17th) at 6:30pm. U15s round 4 Championship away to Ballinamore (SOH) on Friday (21st) at 6:30pm. Smith Monumentals IFC – The Annaduff lads finish the group stages after a close encounter with Sean O Heslins (Ballinamore) on Sunday last in Pairc Sean Carrick on Shannon. Full time score Annaduff 1-12 to Ballinamore 0-13. The Q/final sees us drawn against Ballinaglera. Team: Darragh Burke, Dean Gill (0-1), Hugh Moylan, Chris Farrell, Mattie Cox, Dillon Keane, Jimmy Cox, David Duignan (0-1), Ronan mcCormack, Eoin Gill (0-2), Conor Reynolds, Sean McNabola, Sean Duignan (1-4)(3f), Kenny Cox (0-2) and Alan Glancy (0-2). Subs: Donal McNabola for Mattie (15min), Frank McNabola for Ronan (50min), Stephen Murray for Alan (55min), Dermot Reynolds for Chris (61min) and Mathew Reynolds for Jimmy (63min). Annaduff Ladies – There was a great buzz around the Parish on Sunday evening last as Annaduff’s ladies brought home the silverware and title of Leitrim Junior champions. A close encounter throughout against Keeldra Gaels (Gortletteragh-Cloone). Annaduff just getting across the line by 1 point. Full time score Annaduff 5-8 to Keeldra Gaels 4-10. Congratulations to Captain Evie, all the girls and Management of Ann Marie Cox, Joe Keville and John Russell. Also big thanks to John Russell, Vibrotone Dromod, for sponsoring the girls and having them fully kitted out in their new Jerseys and gear. Team: Lisa Rinn, Tara Curran, Mairead Cox, Aoife Shanley, Chauntelle Mulvihill, Eimear Quigley, Grainne Reynolds, Carmel Donelon, Sinead Reynolds, Hannah Farrell, Evie Russell (c), Chloe Dolan, Vivienne Egan, Aisling Duignan, Mairead McHugh. Subs: Lorraine Cox, Rionna Cosgrove, Maggie Rowley, Louise Gaffney, Aisling Shanley, Carmel Charles and Ciara McManus. Westlink Coaches U15s Championship – Our U15 boys got their Championship off to a flying start on tuesday 4th where they overcame Drumkeeran. FFull-timescore Annaduff 8-15 to Drumkeeran 1-0. Team: Cian Dockery, Declan Gill, Eoghan Ridge, Tommie Taylor, Niall Quigley, Craig McGuinness, Daniel Bosquette, Cormack Kane, Daniel Lyons, Ultan Kelly, Adam Maxwell, Darren Cox and Shane Faughnan. Sub: Senan Mooney. New Baby – Annaduff GAA wish to congratulate one of our underage Coaches Sean Ward and his wife Deirdre from Dromod on the recent birth of their daughter Sinead. Junior Cert – Best wishes to all our younger Club members getting their Junior Cert results during the week. Lotto – The Annaduff Parish & GAA lotto draw took place in Cox’s, Dromod Sunday September 9th. Congratulations to John Woods, Clooncolry who won the jackpot of €5100. Numbers 3,6,8,11. Next draw will be in McLoughlins Drumsna on the 23rd of September where the jackpot will be €1000. Please get your tickets in and as always Thank you for your continued support!!!!. Fixtures – U15s round 3 Championship home to Melvin Gaels on Friday (14th) at 6:30pm. Smith Monumentals Leitrim IFC Q/Final V Ballinaglera on Saturday (15th) at 3.45pm in Ballinamore. U15s round 2 Championship away to Gortletteragh on Monday (17th) at 6:30pm. Pyramid Bookmakers JAC – Hard luck to our juniors who exit the Championship after a tight encounter with Glenfarne/Kilty on Saturday evening last in Parc Sean. Full time score Annaduff 3-8 to Glenfarne/Kilty 3-12. Annaduff GAA – Best of luck to the Annaduff Ladies in the Leitrim Junior Championship final V Keeldra Gaels on Sunday next (9th) at 1pm to be played in Bornacoola club grounds. Come along and get your flags out around the Parish to support the girls. U13s Championship – Hard luck to our U13s who lost out in the D1 Championship semi final to Leitrim Gaels on Monday last. The club wish to sincerely thanks the lads efforts and commitment over the year. A big thanks to the Parents for travelling to training and games up and down the County. Your support is greatly appreciated. Also a big thank you to their mentors Ronan Mooney and Mark Beirne. Westlink Coaches U15s Championship – Best of luck to the management and players from our U15s boys team as they kick off the first round of Championship home to Drumkeeran on Tuesday (4th) evening. 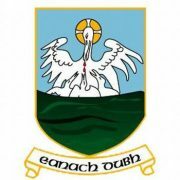 Sympathy – Annaduff GAA wishes to pass on our sympathy’s to a former Annaduff star Frank Shanley (Finnelaughta) on the death of his partner Bridie Fahy who was recently laid to rest in Finnure local cemetery Co. Galway. May her gentle soul rest in peace. Fixtures – U15s round 1 Championship home to Drumkeeran on tuesday (4th) at 6:30pm. Annaduff Family Fun Day 2018 – The 5th Annual Annaduff Family Fun Day took place on Sunday last the 12th of August. This year’s Charity Partner is Pieta House. A massive thanks to the hard working committee who as always make the day the success it is. Thank you to all who supported on the day, to the Coaches and all who helped out. To the other neighbouring Clubs that brought their younger players. A special thank you to following: Gerard Creegan for his help, sorting the farm equipment, D&E McHugh for supplying the farm equipment, Brian Beirne, Thomas Crowe, Alma Jordan of Agrikids for her child presentation and last but not least Peter Gohery, for his demonstration. The draw took place in Coxs Dromod 1st prize (Trip to London) Grainne Reynolds Corduff, 2nd prize Angela Hanley Watervale, Rooskey, 3rd Clodagh Boland Doon Offaly, 4th Claire Guckian Millbrook Dromod, 5th Maurice Shanley Annaduff, 6th Leo Cox Cloonfour. Club Annaduff – All Ireland Hurling tickets draw: Vincent Tight, Gerldine Thornton. All Ireland Football tickets draw: Hugh Moylan, Derek Cox. Newtown Engineering Under 17s Championship – Well done to our U17s who overcame Dromahair on Tuesday last. Full time score Annaduff 3-20 to Dromahair 2-14. The lads will now play for a spot in the Final. Barna Recycling Under 13s Championship – Annaduff Under 13’s won their D1 Championship game on Thursday last to St. Josephs on a scoreline of Annaduff 4-10 to St. Josephs 1-06 The lads still remain top of the group. Smith Monumentals IFC – Our Intermediate Championship continued in Ballinamore on Saturday last where the opposition was Eslin. A disappointing result for the Annaduff side finishing out 0-11 to Eslin 3-05.